The perfect fall day = chilly temperatures and a brilliant blue sky. That is exactly what we had on Block Island this weekend. Morning temps in the mid-30s, warming to the mid-50s in the afternoon. We walked all over the island, enjoying no crowds and the stunning October scenery. The colors were beautiful. Design inspiration everywhere. 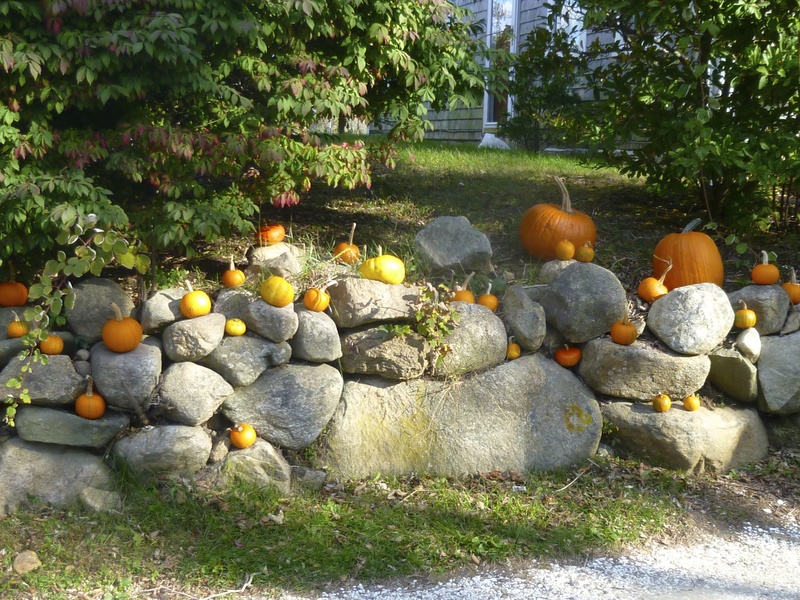 Pumpkins on stone walls. On porches. A completely different feel from summer. We ate decadent lobster mac and cheese at Winfield’s and fresh halibut at Eli’s. The Empire movie theatre was showing The Martian and we almost went…. But, after an amazing dinner, we opted for an evening in. At night, the stars were unbelievable. Every constellation was visible. It was a fabulous weekend. Something we will do again, very soon! Lucky you guys! Block is gorgeous during all seasons! Arrived today, Oct 23rd, for our annual girls weekend. We all feel so blessed to be together and on Block Island for even a weekend! Beautiful fall day. Crisp and clear but a little windy. Loving it here! Have a wonderful weekend Jan! Such a beautiful place.